Electroencephalography, or EEG, is an electrophysiological monitoring device comprised of multiple electrodes (small, flat, metal discs with thin wires) placed on the scalp that send signals to a computer in order to noninvasively measure and record electrical activity on the scalp. EEG can be used in cognitive research or to diagnose conditions such as epilepsy and sleep disorders. Heart rate variability (HRV) is a measure of the patterns prescribed by interbeat intervals of time and the functioning of the heart. HRV has been described as a psychophysiological biomarker to assess coherent or stressful states associated with respiration, cognition, and emotions (McCraty et al. 2009). Psychophysiological coherence has been widely described as a state conducive to optimal cognitive performance and improved health (McCraty et al. 2009) that has also been associated to inner balance, peace, and harmony (Davis et al. 2018). Biofeedback systems are computerized devices that provide information about the activity of physiological measures, such as heart rate variability, in order to learn how to modulate at will specific body functions to improve energy management, health, self-mastery, and general well-being. Biofeedback systems may include HRV, EEG, ECG, EMG, and respiration machines, among others. Brain or heart computer interface refers to cybernetic systems that allow data acquisition from sensors or electrodes, which monitor brain dynamics via EEG or cardiac activity via HRV, with the possibility of online processing and data storage capacity. Multiuser computer games are games that allow audiovisual and text exchange via personal computers, laptops, tablets, or smartphones, which facilitate online interaction between different users in different locations. Since ancient times humans have lived in a struggle between the fulfillment of survival needs and the achievement of inner peace. Many ancient traditions provide a body of wisdom with tools and practices to achieve such inner states. However, for the majority of people “making a living” in the modern world, long meditation retreats or spiritual quests become a luxury that is difficult to attain. Fortunately, modern technology when combined with ancient wisdom, mainly breathing techniques, can support us to move closer toward the ideal of inner peace with very good results. Recently many users of biofeedback systems have incorporated these tools to accelerate their learning process in achieving peaceful cognitive states associated with low stress levels and cognitive clarity, with their associated mental, emotional, and physical benefits. There are different types of biofeedback systems available; however, here we focus on EEG and HRV only. The purpose of this entry is mainly informative and emphasizes the benefits of using biofeedback systems in order to reduce and manage stress as well as to harness positive emotions, optimal cognitive performance, general well-being, and inner peace. Throughout the entry the reader is guided and referred to what the authors consider a condensed, solid body of literature to support in deepening his or her understanding on the subject. Perhaps one of the main contributions of the entry is in highlighting the need to synthesize a body of knowledge that brings together the role of brain, heart, and respiration interactions in mediating cognition associated to inner states of peace and harmony. The authors would be glad if the reader felt encouraged and inspired to conduct more research in this promising area as well as derive benefit from the use of these kinds of biofeedback systems. Modern biofeedback systems combine the analysis of EEG data together with a very coherent, informative, and aesthetic display and are able to provide an almost instant reading, as well as keep records of the different sessions of relaxation or meditation, for example, and their associated brain dynamics. This serves the user in learning how to modulate brain states at will, by making sense of the graphical output in relationship to the subjective knowledge of one’s self and one’s cognitive states. With practice and attention, the user can induce at will alpha (~10 Hz) states in certain regions of the brain, and that may serve as a biomarker for, let’s say, a relaxed state (Davis et al. 2017; Davis and Kozma 2018a). Such a tool can also be enhanced by a monitor of HRV, which according to many studies (McCraty and Tomasino 2004; McCraty et al. 2001, 2006; Davis et al. 2018) serves as a good indicator for psychophysiological coherence and relaxed and harmonious inner states. Most of the currently widely available biofeedback systems provide one or the other tool; however, it is expected that in the near future, biofeedback systems will integrate heart and brain measures together with others like respiration rhythms and hormonal release measures, for example. More importantly, all these technologies, we conjecture, could be integrated to a new generation of multiuser computer games, which will challenge and support every user in virtual interactions to acquire cognitive and psychophysiological coherence skills. These computer games could also be integrated as part of the education process in acquiring social skills and the knowledge to achieve general well-being. It is important to note that these computer games could also be developed in applications for smartphones and other devices with intelligent advisors that suggest a set of activities or missions to be accomplished and monitored in real life, for example, the new application by the name “Mission Me” (Apple Inc. 2018). Understanding the complexities associated with the generation of peaceful inner states is a prerequisite to building reliable biofeedback systems. For example, when the synchronization and desynchronization between different oscillatory systems in the body are observed via multiple biomarker measures, we are challenged to systemically study the dynamics of the heart, the brain, and the respiratory system to name a few and, in doing so, unravel their coupling properties in describing different cognitive states usually associated with different emotional expressions as shown in recent studies (Heck et al. 2017). It is common knowledge that emotional and mental states that are commonly associated with an “aching heart” and a “confused mind,” caused by marital breakdown, for example, come together with very different bodily sensations than the experience of “nirvana” or “joy” that people experience in meditative states. Therefore, it becomes relevant to know how the heart, the brain, and the hormonal system act as coupled oscillators and then use this knowledge to learn how to modulate their dynamics at will, via the respiratory system, with rhythmic breathing techniques that may facilitate a transition from an “aching heart” into a “joyful” one and from a “confused mind” to a “clear mind” state. The design of a biofeedback system is a work of engineering that may require input from many different areas of knowledge like science, art, philosophy and ancient wisdom, and most certainly the development of mathematical methodologies that involve both linear and nonlinear systems and that could possibly describe brain dynamics, for example, as a consequence of intentional action and values-based decision-making, leading to cognitive states which are associated with inner peace and harmony, involving the abovementioned oscillatory systems (Baars 2013; Freeman et al. 2000; Buzsáki 2006; Davis 2009; Schwartz et al. 2005; Kasamatsu and Hirai 1966; Austin 1999; Childre and McCraty 2001; McCraty and Tomasino 2004). 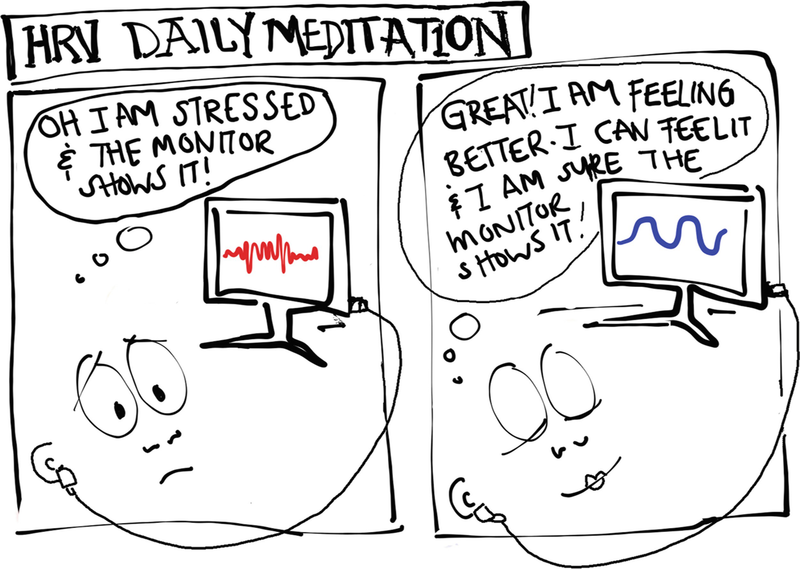 This would mean that a well-designed biofeedback system should allow the user a cybernetic interaction (human-machine interaction) with the goal and intention to achieve relaxation and inner peace by exploring different choices and making decisions that are valuable and meaningful for the user, for example, meditating before an exam or important meeting in order to improve cognitive clarity and emotional stability (McCraty 2002, 2017; McCraty and Tomasino 2004). Some authors have developed theories and methodologies to study cognition that are intended to improve on the understanding of the brain in a holistic or systemic way, based on brain field dynamics (Kozma et al. 2012; Davis and Kozma 2012, 2013; Kozma and Freeman 2002; Pribram 2013). These methodologies based on Freeman’s neurodynamics and Pribram’s view of the brain are very relevant to the study of mind and consciousness, as manifested in nonlinear brain dynamics that involve large cortical regions intended to uncover how the brain allows for perception of reality and the emergence of knowledge and meaning in relation to the higher faculties of the mind (Del Cul et al. 2007; Seth et al. 2008). The reader needs to note that the mind and its workings are intimately related to the willful generation of relaxed, less stressful, and ideally peaceful states and that these kinds of theories and methodologies are instrumental in designing algorithms to analyze brain data, which ultimately can be embedded in robust biofeedback systems that allow for cognitive inner state exploration via monitoring brain activity (Davis and Kozma 2014, 2018a). Similar theories and methodologies have also been developed for the analysis of heart rate variability signals based on a thorough understanding of the complex interaction between the two branches of the autonomic nervous system, the respiratory system, and the heart. These methodologies have also contributed to the design of biofeedback systems that support the learning process of modulating one’s cognitive and emotional states (McCraty et al. 2006). Perception of reality is modulated by the interaction of the environment and our human body. Each time we receive sensory input or generate internal signals associated to hope for a desired goal, for example, our brain, which is a very complex system, interacts and communicates continuously with different systems in the body, like the nervous, cardiovascular, and respiratory systems, to name a few. The body, when taken as a whole, is better comprehended in its functioning, and it is easy to realize that changes which manifest in one bodily system will affect other organs, members, or systems of the body. Intentional action requires the brain to create knowledge and meaning and that in turn provides a means for evaluating, coordinating, and controlling human behavior. Learning about our reactions and thought patterns and how to keep and nurture the constructive ones, while addressing properly the destructive and negative ones, requires self-vigilance and mastery. Meditation has been proposed as a practice to achieve such self-mastery, and Sarah Lazar among others has conducted studies in this area. The reader is directed to a comprehensive list of Lazar’s publications (Lazar 2018). Disturbances associated with stress that are received from diverse sensory input have been shown to manifest in a variety of frequency bands in brain dynamics (Freeman and Quiroga 2013; Freeman et al. 2003), while peaceful cognitive states, when self-induced via meditation, have been observed predominantly in the midrange of brain frequencies known as the alpha band (Freeman et al. 2000; Buzsáki 2006; Davis 2009; Schwartz et al. 2005; Kasamatsu and Hirai 1966; Austin 1999). In order to benefit from the information that our brains can provide, we need tools like biofeedback systems that are integrated to EEG data acquisition and the analyses of these EEG signals. Modern technology has allowed for EEG-based biofeedback systems that can incorporate a graphical display module of brain signals or a movie of spatiotemporal brain dynamics (Davis et al. 2015a) that help the practitioner or user to engage in visualizing brain patterns, either intermittently during or post meditation, in order to learn to change the pattern that is visualized, by changing breathing patterns or attention, for example, until the desired cognitive states are achieved. It is similar to an explorer seeking for a path to the river in the forest; once it is found, traces are left with the proper markers. In our case these markers are movies or displays of brain dynamics (Davis and Kozma 2018). A practitioner or user could learn the differences between various cognitive modalities and their associated brain dynamics and subjective experience, such as (a) closed eyes; (b) open eyes; (c) open eyes accompanied by a visual stimuli, like an intermittent flashlight; and (d) intentional meditation to generate peaceful states of being (Davis et al. 2016, 2017; Davis and Kozma 2018a). In order to quantitatively classify between modalities and cognitive states, the future of biofeedback systems will need to provide user-friendly interfaces for that purpose. In so doing, the user would be able to learn to discriminate between states with a high degree or level of certainty or significance toward a deeper understanding of the neural correlates of his or her own consciousness. In order to achieve all this, various already available studies from different fields and disciplines, such as mathematics, systems neuroscience, and engineering, among others ought to be combined (Kasabov and Capecci 2015; Davis et al. 2016; Pribram 2013; Kozma et al. 2014). The advances in biofeedback system technologies suggest a new direction to approach the exploration of questions in regard to consciousness and mental activity and how they are reflected in brain dynamics that complements ancient wisdom and philosophical thought (Davis et al. 2015). Heart rate variability has been extensively studied to the understanding, among other things, of the effect of different emotions and their associated stress levels, usually referred to as psychophysiological coherence (McCraty and Childre 2010; McCraty et al. 2001; Childre and Cryer 2008). There are different ways of experiencing changes in psychophysiological coherence; some are toward higher stress levels, while others are toward more coherent states with an associated significant reduction in stress levels. This can be monitored via a coherence ratio, which is an index that presumably captures the relationship between the two branches of the autonomic nervous system (sympathetic and parasympathetic) via a Fast Fourier analysis of the HRV signal. There is extensive literature about how to calculate the coherence ratio and how to interpret it or derive other useful signals from it. The brain, heart, and respiration dynamics are essential in mediating psychophysiological coherence, and this is reflected in HRV measurements (McCraty et al. 2006) (Fig. 1). Several technologies and diverse equipment have been developed for the monitoring of HRV, ranging from clinical and research devices like the Firstbeat monitor (Firstbeat Technologies Ltd. 2017), as well as monitors that can be used on a daily basis by the general population, which are very accessible, like the emWave Technology (HeartMath LLC 2016). Several authors have studied the relationship between perception, awareness, spiritual experience, relaxation, and general well-being, presumably involving the coupling of the brain and heart, modulated by respiration (Kim et al. 2013; Childre and McCraty 2001). It is important to mention that there is an extensive body of ancient wisdom, philosophical ideas, and hypotheses that emphasize the role of the “heart” in “basic leadership,” intentional action, and decision-making (van der Eijk 2007). Much of the advice that we find in various texts suggests different ways in how to handle the “more profound” spiritual experiences (Davis 2009). However, in this section, we focus on the application of HRV and psychophysiological monitoring technologies, which come as a means to assist every human being who is willing to find inner peace and harmony and access high coherence levels, regardless of his or her metaphysical commitments, and, in so doing, create a neutral biological bridge to the different understandings about the subject of inner peace. There are profound implications associated to the use of such devices in fostering individual and social harmony, related to deep feelings of appreciation, love, and compassion (McCraty 2002; Crivellato and Ribatti 2007). Recent studies have shown that the heart is involved in the modulation of physiological states associated with emotions that can lead to stress or tranquility. Mastering desired physiological and cognitive states at will has become almost routine for practitioners of meditation and relaxation, leading to what more recently has been known as psychophysiological coherence or heart cognition (McCraty et al. 2006). We have touched on scientific knowledge applied to the understanding of how to embody peaceful states of being, which are meaningful and valuable to the individual’s decision-making process. We have also mentioned that the combination and proper application of wisdom, science, and technology may lead to individual peace and social harmony, where the ancient art of peaceful living is turned into a science of coherence (Childre and McCraty 2001; McCraty 2017). To develop inner peace in a way that is meaningful to the individual requires the brain to derive meaning from internal as well as external events that will facilitate the creation of new deeper meanings and a broader knowledge of reality and self (Davis and Kozma 2013; Kozma and Davis 2018). We have highlighted that it remains a mystery to be solved how the brain and heart participate in the creation of trivial and deeper meanings and the fact that in recent years, science has taken an active role in the exploration of this mystery via the art of encephalography and EEG. We have mentioned that recent technologies have been developed to measure HRV and that studies of heart coherence have flourished, almost as a form of standard language, to build a bridge between subjective experiences, associated with different paths toward inner peace, and objective measures, like the coherence ratio associated with coherent cognitive states. For all practical purposes, in the broader arena of society where secular views merge with spiritual ones, the term psychophysiological coherence refers with great clarity and in a scientific way, to an initial step to “unlock the doors” to higher cognitive meanings in the spheres of psyche, soul, and body (Childre and McCraty 2001). The ideas presented here have the potential to advance a science that will improve the understanding of values-based decision-making and, we conjecture, will facilitate a change in perception and perhaps in paradigm, for an individual to constructively apply his or her intelligence and choose, at will and consciously, for peaceful behaviors to improve society and leave a better place and possible scenarios of peaceful living for future generations. In all certainty, a good beginning is associated with the use of brain and heart biofeedback systems for stress reduction, relaxation, and meditation. The new generation of biofeedback systems should aim at an integration with brain and heart computer interfaces that allow the user to learn about his or her cognitive inner states, as part of computer games that are both fun and challenging, to keep the learning process interesting and alive. With the success of such an endeavor, we could aim at inspiring and motivating children, teenagers, and adults ideally from all cultures and places to keep engaged in the quest for inner peace. These games could be interactive between people from different parts of the world who challenge and support each other to develop such skills.